Well not really but it sure feels that way. 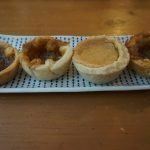 When I left Ontario’s Best Butter Tart Festival in Midland on June 11, 2016, I had butter tarts from four different bakeries. Two were purchased based on pedigree and performance and two were purchased on whim. 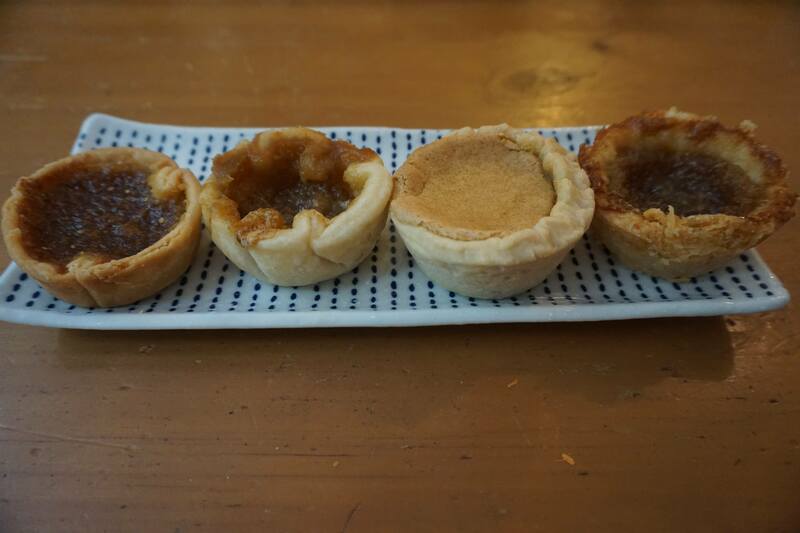 In the interest of consistency, they are all plain butter tarts. 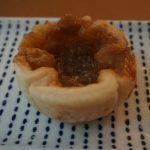 I had thought about choosing criteria and rating each based on a scale but butter tarts, like any food, are highly subjective. 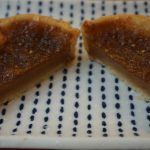 The attributes that I chose to focus on were: how the tart cut, how much the crust flaked, the taste of the crust, and the consistency and taste of the filling. Below I have each tart with my tasting notes. This is going to be fun. The first thing I noticed was the thin crust which resulted in a high filling to crust ratio. 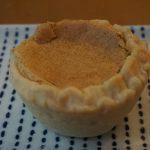 The crust itself was very mild flavoured and contributed little to the tart other than holding the filling together. There was a mild flake to the crust, leaving some crumbs on the plate. 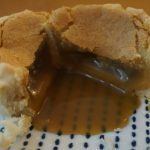 The filling had a firm set with no pooling and had a flavour reminiscent of caramel. This crust was much more substantial than the previous tart and had a strong taste of flour to it. When I cut the tart, the crust had less flaking than Hewitts. The filling, while firm, was a tad bit looser but as you can see from the photo it still held together very well. 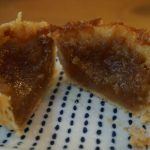 The dominant flavour of the filling reminded me of toffee but the crust overwhelmed the filling. This tart had another thick crust to it. The crust had a lovely buttery taste to it and nothing by way of flaking aside from one big crumb that you can see in the photo and I think that was from my knife work. The filling was quite loose and runny with a hint of maple flavour. The crust of this tart in the middle as far as thickness but was the flakiest and tasted like shortbread. 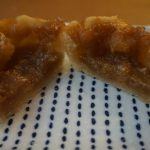 The tart cut cleanly with nice firm filling. I found the filling to be almost too sweet with just a hint of caramel undertone. Now for a little background: Doo Doo’s Bakery has won best butter tarts at the festival for three consecutive years (2013-2016). 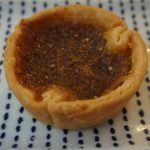 Betty’s Pies and Tarts won best butter tarts at the Royal Agricultural Winter Fair 2014 and 2015. So which tart did I like the best? If I HAD to pick one I would have to say Doo Doo’s overall. 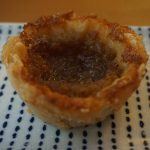 If I was going to create my ideal butter tart it would be Betty’s filling in Doo Doo’s crust. 3 response to "I ate my Weight in Butter Tarts"
I admire your patience to wait in the Doo Doo’s line. We happened upon the Salvation Army stall and they won in the home-baking category either in 2015 or 2014. They were darn good, too, but by far my fave was Betty’s. I think your analysis was great! Thank you. It was my first attempt at serious food comparison so I’m glad it helped. The things I do for research 🙂 On a side note, I found that Betty’s tarts got better after a couple of days, although I can’t for the life of me imagine buying some and then waiting. It just doesn’t seem right somehow.